Jesus loves you and wants you to love Him, but He won’t make you. He won’t force you. 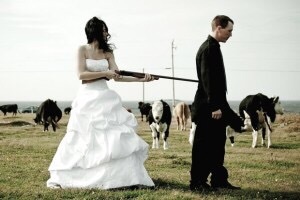 This ain’t no shotgun wedding. God loves you so much that He allows you to pick who you will love. Would if be true love if there was a gun pointed at your back? Would you accept the love of someone who had no other choice? Of course not. It wouldn’t be sincere. It wouldn’t be real. It would be fake. Ain’t nobody love fake. This entry was posted in Christian and tagged Bible, Christ, Christian, Christianity, church, Faith, God, Gospel, Holy Spirit, Jesus, Love, Religion, Religion and Spirituality, Scripture, theology, Worship. Bookmark the permalink.